Monte-Carlo Société des Bains de Mer (Monte-Carlo SBM) has transformed the world-renowned Hôtel de Paris Monte-Carlo — the beating heart of Monaco’s playground for the world’s rich and famous, founded in 1864 — into the modern age, piece by piece and over four long years, without ever closing its doors. Hôtel de Paris and “Monte-Carlo” (a then new district of Monaco…) were essentially the dream of Charles III, the Prince who ruled from 1856 until his death in 1889. He commissioned Frenchman Francois Blanc who had successfully developed a first ‘resort’ concept in Bad Homburg – Germany. Although Monte-Carlo was almost immediately a success in its European backyard, it is under the reign of Prince Rainier III and in the wake of His wedding with Hollywood icon Grace Kelly that Monaco acquired World fame. Nowadays, 150 years after Monte-Carlo was developed, Monaco boasts the highest per-capita-income in the world although it is smaller than Manhattan’s Central Park and it has no arable land or mineral resources. Located on the Mediterranean shore near the French-Italian border and with 498 police officers for 39,000 residents, it is one of the safest places on earth. Often known for the Formula 1 Grand Prix, Monaco is also a country which has been pioneering renewable energy and clean technologies as exemplified by the Monaco e-Grand Prix, the eco-responsible Grimaldi Forum Congress Centre, the Monte-Carlo e-Rally or the marine conservation “Monaco Blue Initiative”, attended annually by experts in ocean management and conservation from United Nations agencies and more. Monaco’s large impact in the global arena as a forerunner in the global effort towards sustainability and conservation defies what its small territory may suggest. This dream is now governed by Rainier’s son Prince Albert II, who carries on the legacy of his forefathers through his Foundation’s efforts for the preservation of the environment, endangered species and water. Favoured stomping grounds of the international elite, yet also a stronghold of efficiency and sustainability, Monaco is a place where anything is possible. The Principality’s latest feat is the stunning 270 million Euro renovation of the Hôtel de Paris, a hotel that Prince Charles III had built to be the most luxurious in the world. The 100-room hotel built by the architect Dutrou in 1864, has been expanded seven times over the years and benefitted from a romantic destiny that saw it become part of the history of Monaco and also of the world. The hotel was the first in Europe to boast electricity and private bathrooms in each room, each with running hot water. The best architects, decorators and artists were commissioned for the hotel, which has welcomed royalty, heads of state, ministers, heads of industry, scientists, artists and celebrities for over 150 years. With clientele that included Rockefeller, Rothschild, Vanderbilt, Churchill, Ravel, Debussy, Berlioz, Charlie Chaplin, Errol Flynn or Cary Grant, the hotel soon became as famous as its guests. The Hôtel de Paris has hosted numerous society events including balls and charity galas including the famous Grand Ball of Princes and Princesses. The meticulous modernisation of this iconic hotel started in 2014, with the vision to articulate and further define the founder François Blanc’s dream of “a hotel that surpasses everything”, thus perpetuating the legend into the 21st century. Partial deconstruction, reconstruction, the harmonisation of spaces, the design of new areas, creation of exclusive suites and the evolution of gastronomy; the transformation of Hôtel de Paris Monte-Carlo was entrusted to architects Richard Martinet and Gabriel Viora, who dedicated themselves to enhancing and preserving the timeless spirit of the building. 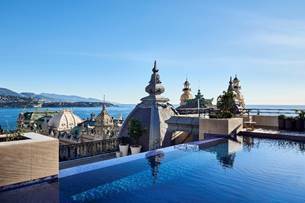 • In May 2017, Hôtel de Paris Monte-Carlo revealed the revived Rotunda Wing, showcasing new rooms that further elevate the standard of the hotel with a minimum size of 34 m2, using the most refined materials available. • In November 2017, the sumptuous Princess Grace Suite was inaugurated by H.S.H Prince Albert II and Princess Stéphanie – it is the most exclusive suite in Hôtel de Paris Monte-Carlo to date. • In June 2018, the famous Le Bar Américain unveiled its new-refreshed look, by interior designers David Collins Studio with a new terrace that opens onto the sea and Place du Casino. • The new Monte-Carlo Suite followed – found at the heart of the hotel, it prolongs the “luxury gaming” experience of Casino de Monte-Carlo for the most prestigious players on the planet seeking discretion and an even more personalised service. • In December 2018 Hôtel de Paris Monte-Carlo unveiled its new courtyard patio. A 671 m² green space at the heart of the hotel, it is a prestigious courtyard lined with luxury boutiques including Graff, Harry Winston, Omega and Stardust. • At the very end of 2018, the famous Louis XV – Alain Ducasse à l’Hôtel de Paris restaurant regained its original setting next to Place du Casino. The golden decorations, frescoes and hangings in the Salle Empire have all been restored to their full splendour. • Following the popularity of 3 Michelin-starred restaurant Louis XV – Alain Ducasse à l’Hôtel de Paris, the award-winning chef introduced a new restaurant in January 2019, Ô Mer. Found on the ground floor of the Rotunda Wing, the restaurant, designed by Pierre-Yves Rochon, overlooks the beautiful hotel gardens and offers a Mediterranean menu with flavours and tastes from Greece, Lebanon, Turkey, Morocco and Tunisia – with a hint of the Hispanic, the Riviera and Maltese shores. • 29 January saw the inauguration of a spectacular new suite on the top floor, overlooking Place du Casino: Suite Prince Rainier III. The largest suite at Hôtel de Paris Monte-Carlo, the suite has been meticulously dressed with personal objects and ornaments, and offers a one-of-akind experience. Hôtel de Paris Monte-Carlo now boasts a total of 207 rooms, 60% of which are suites and include the two most exceptional suites on the Riviera, the Suite Princess Grace and Suite Prince Rainier III. There is no better destination for gourmet indulgence. Hotel de Paris Monte-Carlo houses a prestigious collection of internationally renowned restaurants, notably the 3-Michelin-starred Le Louis XV – Alain Ducasse à l’Hôtel de Paris; Le Grill, a tribute to former SBM-shareholder and shipping magnate Aristotle Onassis; and Ducasse’s new Mediterranean concept Ô Mer highlighting the best of cuisines found throughout the Mediterranean region; famous cocktail bar: Bar Americain; and the Cave de l’Hôtel de Paris, one of the largest private wine cellars in the world with over 250,000 fine and rare bottles on site. Wellness is currently one of the biggest global trends in travel, with nearly all travelers prioritising health and wellness destinations and activities. Hôtel de Paris is home to one of the finest spas in Europe, the 75,000-sq-ft Thermes Marins Monte-Carlo. The spa is famous for its preventative health care and wellness programmes executed by a team of experts including therapists, a doctor, a nutritionist, and health and sports trainers who define the personalised treatments and protocols in accordance with each person’s characteristics. Boasting a magical location right on Monte Carlo’s famous Place du Casino, the Hôtel de Paris will again be the best place, right on the track, to watch the legendary Monaco Grand Prix of Formula 1 this May. “The Hôtel de Paris and Monaco have been a traveller’s dream since the inception of Monte-Carlo. Hotel de Paris is a beautifully nuanced nugget of Monaco’s history and we trust that with the new life which it has now taken on, an experience there will also inspire you in uncovering the many gems that lie within the Principality,” shares Benoit Badufle, Managing Director of Monaco Government Tourism Bureau Asia Office.